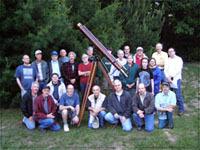 The Chagrin Valley Astronomical Society was founded in 1963 for the purposes of increasing the astronomical knowledge and technique of our members and for public service in our community. Our goals are promotion of public education in astronomy, the continuation of useful research, and the preservation of unpolluted skies for future use of both the astronomer and the general public. We own two acres of land at 15735 Huntley Rd , in Huntsburg Twp. 44046, where we operate Indian Hill Observatory. The site currently has three observatories that house six telescopes. The main focus of the CVAS is observing and photographing celestial objects and events. Many members are active in other aspects of astronomy such as: Observing variable stars, telescope making, astrometry etc. Most members have a great interest in the academic side of astronomy and are more than happy to share their knowledge in these areas. Indian Hill Observatory Telephone Number – (440) 636-5789. Monthly Business Meetings are held the 1st. Saturday of each month (except December). Members are available 30 minutes before each meeting to discuss astronomy related questions with the public and prospective members. To commemorate CVAS's 25th anniversary in 1988, club co-founder Tony Mallama wrote a short history about the club. While most of this web site focuses on recent activities, Tony's story takes us back to the days of CVAS's founding in 1963 before the advent of home computing, large amateur telescopes, CCD cameras and the technology that is able to present this work to you. Tony and club co-founder George Gliba were eager teenagers with a passion for astronomy and to spread that knowledge and enthusiasm throughout their community. The story is written in eight chapters, you can start the journey here. Since our 1963 founding, CVAS members had dreams of building an observatory at a dark-sky site near the Chagrin Valley. That dream came true in May 1978 when longtime member Ian Cooper met college professor, videographer and science enthusiast Keith Richards at the Geauga County Fair. Keith invited us to his property in Huntsburg township were that first Friday evening in May 1978, we observed magnificent dark skies that were unknown to someone living in the eastern suburbs of Cleveland. The following weekend, club members were on the Indian Hill site preparing it for what became a 4 year project in building Indian Hill Observatory. The 1st Observatory has a roll-off roof that that houses the club’s 16” Newtonian reflector telescope. The building was constructed in 1981 and the telescope was dedicated in 1983. From it’s humble beginning as a “hands-on” manual telescope, it has been upgraded to a “go-to” instrument controlled by a computer (first observatory photo history). While major work was completed in 1981, the building has been upgraded over the years with electricity, phone, Internet access, network, and a heated "warm room". Our 2nd Observatory, constructed in 2003 was a 10 foot domed observatory that currently houses 6" and 4" refractors (building the Dome). Then came our application and approval of our tax exempt status and the purchasing the two acres of observatory land that we had been leasing from Keith since 1978. Our 3rd. Observatory is a roll-off roof shed that was donated. You can see how we moved it to Indian Hill and the modifications we made by going here. Other projects in the over the years included expanding the parking lot, improving the telescope operations and expand our public education programs. Membership is open to anyone 12 years of age or older, with an interest in astronomy. Dues are $6.00 a month. Perhaps the best time to get help is at our monthly meetings. The main key here is to make sure you contact a club officer before the meeting to make sure there is someone there to help you. If you need help with equipment, arrange to meet an hour or so before the start of meeting. Or if the meeting is at Indian Hill we can help afterwards. Once you join CVAS , Indian Hill is open to any member 18 years old or older to use at anytime. You can use Indian Hill on your own, other club members do not have to be present. Generally you will find other member there on clear Friday or Saturday nights when the moon is not a problem and we don’t have a star party at another location. Bring a red light of some sort, after dark you should not use white lights. It takes the eye over a half an hour to adjust to dark after being exposed to white light. If you must use a white light or are leaving (requiring headlights), just give everyone in the area a heads up that you about to turn on a light. Never just walk up and start using someone else’s telescope. Most members don’t mind show others what they have in view in their telescope, most enjoy doing it, just ask first. Dress in warm clothing. A good general rule is to dress for about 20 degrees colder than what it is actually. Some other items to bring might include food, drinks, and bug spray. A Star Party is where club members come and setup up their telescopes, show the general public different celestial objects, explain what they are looking, and perhaps answer any other questions about astronomy or their telescopes that they can. Star Party Guidelines It is up to each individual as to what he or she wants to display, the club does not assign objects. Try to arrive before the public does and get your equipment setup. Once it gets dark out, whites lights should not be used, this can make setting up more difficult. Sometimes it is handy to have a step stool for kids when the eyepiece of the telescope is higher up. Keep safety in mind. Since it will be dark out, people might not see the legs of a tripod or other equipment on the ground, so keep an eye out for this. Sometimes people have a habit of wanting to grab the telescope or eyepiece - you might need to explain how to use your telescope correctly. These are star parties where other astronomy clubs from the area are invited to each other site. Generally all intending are amateur astronomers and are more knowledgeable then the general public at other star parties. Many will bring their own telescopes so these events are a good opportunity to see a variety of different kinds telescopes and equipment. Some of these events will have guest speakers and sometimes a registration fee is required. Our OTAA convention usually involves having a potluck dinner, perhaps some type of special recognition for a CVAS member, maybe a presentation by someone, and then a viewing session after dark. No, owning a telescope is not required to join the club. While most members in the club do own telescopes, you do not have to have one. 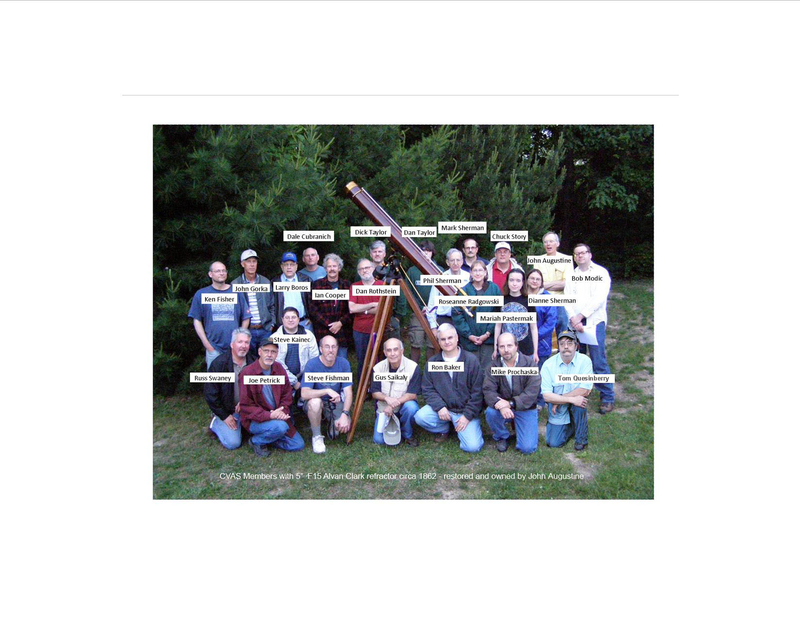 CVAS has club telescopes that are available to any club member to use. The primary disadvantage of not owning a telescope is that you will not be able to show people items at star parties located in spots other than Indian Hill. Actually probably the best way to get started in astronomy is first to use binoculars and learn the constellations first. Use can always use binoculars at star parties, some people actually prefer these over a telescope. Sometimes members are asked to do things like sign a petition or send a letter to someone in order to get them to take action on some lighting issue. There are club members who are very active in this area who can provide help in doing presentations about the effects of light pollution and even help in trying to enact some type of lighting ordinances in your city. Also please consider joining the International Dark-Sky Association (http://www.darksky.org).